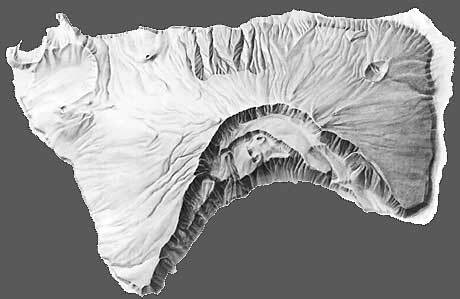 The University of Hawaii at Manoa published Michael Wood’s remarkable hand-drawn shaded relief of Ta’u, American Samoa in the Coastal Zone Management Atlas of American Samoa. The shaded relief also appears in a brochure published by the US National Park Service. “Ta’u Island” (Manu’a Islands, American Samoa) by Michael Wood, original scale 1:24,000, 1980. Ta’u is a high volcanic island resulting from the Pacific tectonic plate sliding over a hot spot far beneath the surface. The island was once larger – most of the southern half slid into the sea cleaving along the caldera boundary, forming the arcing cliffs and terraces along the southern coast. As can be very clearly seen on the shaded relief map, the northern half is a typical shield volcano with gently dipping surfaces only slightly eroded by drainages. The west-east dimension of the island is about 10 km. Tutuila Island, American Samoa (section) by Michael Wood, original scale 1:24,000, 1980. The sequential nature of the volcanic centres of Tutuila Island, with their crosscutting dykes and faults, as well as the caldera and erosional mass deficits, creates a strongly heterogeneous surface. 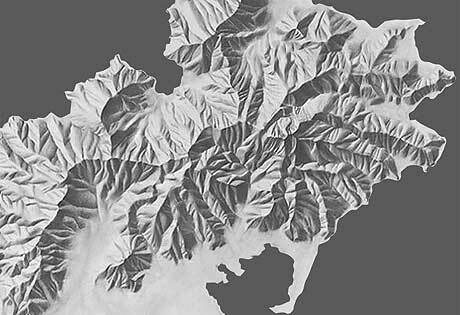 These processes result in very rugged terrain with a non-random drainage network, as is evidenced on the shaded relief map above.